It is the ultimate instant restaurant round. The winner of tonight’s challenge will get a ticket straight to the finals. It is three rounds and after each round only the top teams get through to the next round. The first round is the ultimate plating challenge. The teams have three minutes to plate a dish with the ingredients provided. The judges are looking for the most interesting presentation, they will not be tasting the dish. Because Tim and Kyle won the last people’s choice, they get to sit out round 1 and get to choose the order the contestants will compete, after each contestant plates up, there will be fewer ingredients for the next contestants. The first contestants plating up are Josh & Amy. They have all the ingredients to choose from. They struggle to decide what to put on the plate, by the time they decide on the ingredients they run out of time. They manage to slap some tuna together but it doesn’t look great. 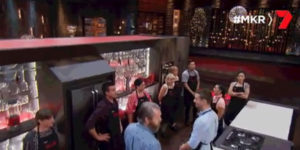 Round 2 is to cook a dish with the given ingredients, but one contestant has to sit out for half the time, then they swap. The judges taste the dishes. The winners are Amy and Tyson and Tim and Kyle. They are now competing in an ultimate test. The have 60 minutes to cook their luxurious dishes.The winner of this cook-off goes straight to the finals. The judges taste Amy and Tyson’s sea urchin dish first. Next they taste Tim and Kyle’s rabbit ragu with fettucine. The judges give away no clues as they taste both meals. The teams are sent away to take a break before the judges reveal their verdict. Manu says Tim and Kyle’s ragu sauce had lots of flavour and he enjoyed the addition of the bone marrow to the sauce. Pete says Amy and Tyson’s sea urchin dish was beautiful and stunning. He says they respected the sea urchin was the star of the dish, the rice was the best rice cooked in the competition. Manu commended Amy on cleaning the sea urchins as it is a difficult job. The team that showed the best luxury dish today is Tim and Kyle. Tim and Kyle will be fast tracked straight to the finals now. Pete says both teams should be extremely proud as they produced neat perfect food. Manu says that it is now time for the ultimate instant restaurant round. The teams will be back cooking in their own homes.